The Details: A room + private study/sun room is available starting December first. The monthly rent is presently $1125 + utilities, which average $80 or less. We are currently renegotiating our lease but do not expect the total cost to rise much, if at all. The new lease will end in July 2019 and we are interested in a roommate committed to remaining until then. The Rooms: The bedroom is 12.5′ x 12′ and the study/sun room is 10′ x 11′. Both rooms (which are connected) are spacious and sunny. The bathroom would be shared with one roommate and is located immediately outside the rooms. The House: The large, airy house is located just north of Mt. 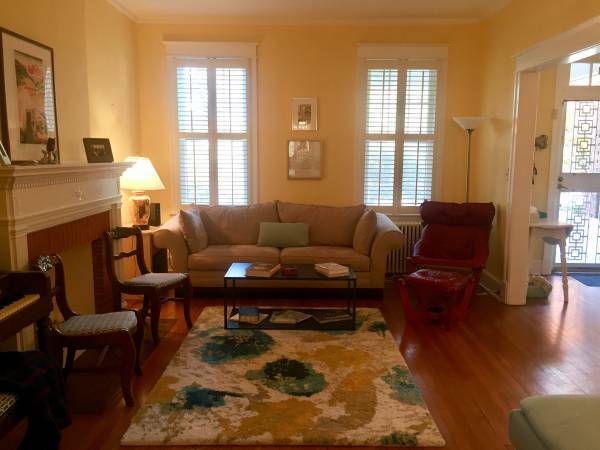 Pleasant in a safe neighborhood surrounded by Rock Creek Park on 3 sides. We know most of our neighbors. 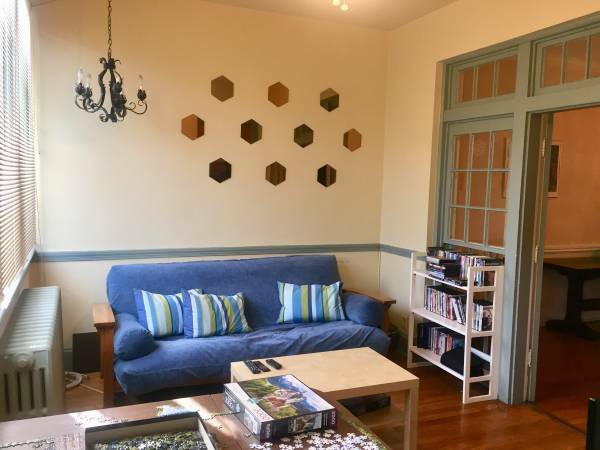 It is an easy, 20-30 minute commute to downtown DC via the 16th street bus lines and Columbia Heights metro, and there is ample street parking. The kitchen was recently updated and the living areas are all fully furnished and tastefully decorated. A new washer/dryer unit is located on the second floor. We often enjoy our front porch swing, back deck grill, and small yard. The house also includes a furnished guest room shared by all three roommates (pic #8). The Roommates: We are two women in our twenties who have been very happy living here for 4+ years and are looking for a similar person to join us. One of us has a medium-sized dog who is very well behaved, but unfortunately our landlord will not approve any additional pets. Both of us like to mix private and social time and we share food expenses and cleaning responsibilities.